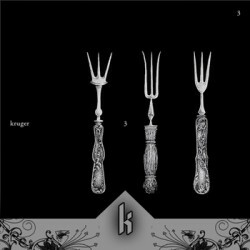 After four albums three years of silence followed; now the Swiss band Kruger is back with two songs on a 10 inch. The song titles ‘The Wild Brunch’ and ‘Herbivore’ are contradictory if you ask me. I imagine deer, boar or rabbit on the menu of a wild brunch but an herbivore won’t eat any meat. Is it a joke or do the Kruger boys want to make a point? When I listen to the first track I never will know. ‘The Wild Brunch’ starts directly with the groovy Sludge Rock/Metal we usual hear from the Lausanne band. No new things, just a quality song. A dissonant and haunting riff starts the engine and later it continues in the typical Kruger rollercoaster. Small downside is the melodic vocals that could’ve been better or could be removed by the usual growls. The flipside starts with a vocal line about bashing hipsters. Is it about hipsters that refuse to eat meat and better could try some wild brunch to become a real man? I don’t have the complete lyrics so I am only guessing. What I know for sure is that I like this side better. Crunchy drums and an addicting riff are building up the song. Later the song has that typical underlying stomach feeling you also have when you listen to Tool. No, Kruger isn’t Tool on this record, they are much heavier and rougher and you’ll hear that in the later part of the song. The screaming and threatening music is giving you an unpleasant feeling. I want more of that please! If you liked their previous work and live shows don’t hesitate to pick a copy of the very limited 10 inch. You already can hear the songs on http://krugerofficial.bandcamp.com.